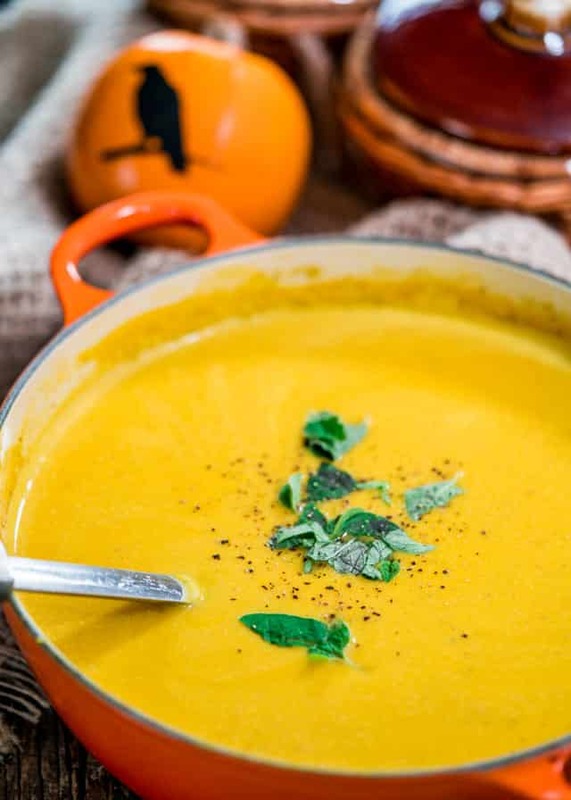 This Curried Butternut Squash Soup is perfectly spiced with cumin, curry and turmeric, loaded with butternut squash and apples. Creamy, delicious and soul-warming! This recipe is the epitome of fall comfort food. It’s definitely soup weather where we’re at since it’s cooled down quite a bit. We’re even expecting snow in the next couple days, so yeah, definitely soup weather. What’s it like where you’re at? If it’s cooled down, then I have the perfect, and I mean perfect, soup for you. Of course, you don’t need cold weather as an excuse to make this incredible easy soup, because really for me it’s soup weather year round. 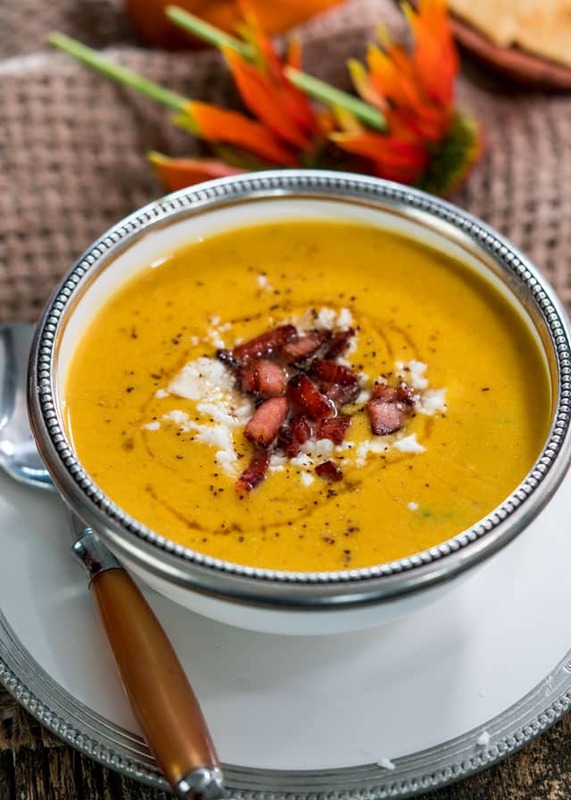 Are you ready for some curried butternut squash soup? It’s so easy and you probably have all the spices you need in your spice cabinet right now. I don’t cook with butternut squash often, but once fall hits and I see it in grocery stores, I’m always drawn to it, but many times I shy away from it. This time however, once I saw it I just couldn’t shake the idea of a yummy curried butternut squash soup from my mind. This recipe couldn’t get any easier and it really only requires some simple ingredients, because as we all know, I’m all about simple recipes. But that’s not what I love most about this soup. I’m so in love with the flavors in this soup. It’s so creamy, perfectly spiced, you can taste all the wonderful ingredients in every bite, it’s simply soul-warming. And so perfect for this time of year! We enjoyed this sprinkled with some goat cheese, crispy fried bacon and a drizzle of maple syrup and served it with some cheese crackers. But I imagine this would be incredible served with a panini such as my Cuban Panini or a wrap such as my Turkey Hummus and Veggie Wrap. In a large soup pot add the bacon and fry it until crispy over medium-high. Remove the bacon from the pot and set aside. Leave the bacon fat in the pot. Add the chopped onion and cook for about 3 minutes until it softens and becomes translucent. Add the garlic and cook for another 30 seconds. Add all the spices: curry, turmeric, cardamom, cumin, coriander, salt, pepper and stir. Stir in all the chicken broth then add the cubed butternut squash and apple. Turn the heat down to a medium and cook for about 15 to 20 minutes or until the butternut squash is fork tender. 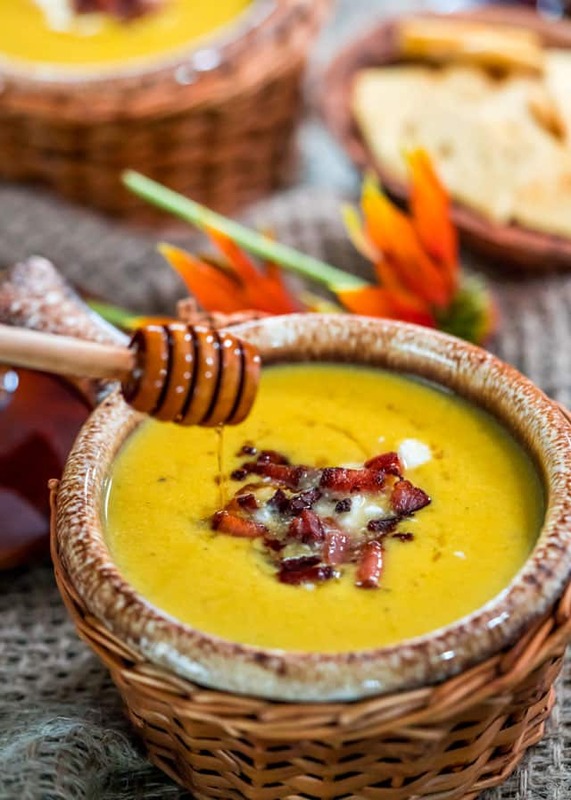 Use an immersion blender to puree the soup on high until creamy and smooth. Alternatively you can transfer the soup to a blender and puree it that way. Stir in the heavy cream and bring to a boil. Taste for salt and pepper and adjust as necessary. Garnish with fresh oregano and serve as is or top with goat cheese and crispy fried bacon. Sometimes you may be able to find butternut squash that's already peeled and cubed in your local grocery store. A potato/apple peeler work well for peeling the skin off a whole butternut squash. Store leftovers in an airtight container in the fridge for 3 to 4 days, or in the freezer for up to 1 month. Coconut milk can be used in place of cream to make this dairy-free. Nutritional information does not include goat cheese and maple syrup. Please keep in mind that nutritional information is a rough estimate and can vary greatly based on products used. Just made this and it is delicious. I left out the bacon and added one carrot and one small potato. 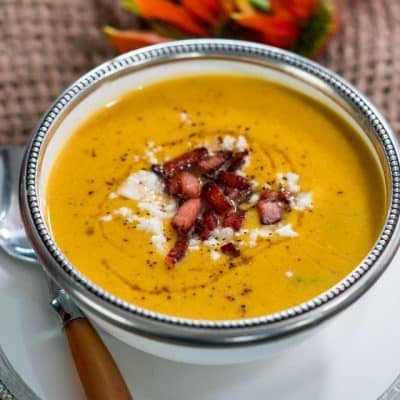 I think it is one of the best butternut squash soups I have ever made. I love the spices as it adds so much flavour to it. I will certainly make this again. Thank you. Made this for lunch today! Was quick, easy and the perfect “comfort soup” for a rainy West Coast winter day! I truly don’t mean to sound like a recipe hacker, but because my daughter is dairy free and vegetarian and because I wanted to make THIS soup recipe, I adapted the recipe by skipping the bacon, used coconut oil to saute veg., used veg stock instead of chicken stock and used coconut milk instead of heavy cream! We didn’t miss the bacon, although I am sure it would be superb WITH bacon! Was still a delicious vegetarian version!! Thank you for the inspiration! Making this for Thanksgiving dinner (Canadian this weekend). Made it ahead and had a sample and good gosh not sure it will make it to tomorrow when my kids show…This has been added to my recipe collection! I guess you could always make some more. 🙂 So glad you like it and happy Thanksgiving! Well this was certainly a hit for my meal. Went over so well my daughter took your recipe with her!